Late last year I stopped off at Island Vibe in Jefferys Bay for the night, in the hopes to wake up to some perfect cooking right hand waves at Supertubes. That morning I woke up around 5.30am and made my way down to the beach where only 1 other guy was out, and the waves were firing! I was so stoked and surfed for about 2 hours before I had to leave and continue my journey down to Cape Town. The next day, Phil Craig, the photographer and legend who was taking photos that morning sent me some of the pics along with a line saying, dude, you'll never believe it but the boys from JackAss are here and staying in the same suite you stayed in. WHAT! I couldn't believe it, the FOMO was real, I never really get fomo but in that moment I could feel it more than ever, I missed my chance at meeting the dudes from JackAss by a couple of hours, I was bleak! Then... about 3 days later... I received a call from a friend who runs a surf camp in Indonesia asking me if I would like to show the boys from JackAss around Cape Town for a day or two.. I mean what, are you kidding, this world works in very mysterious ways. I was meant to be working on the date I was due to pick them up from the airport, so with a little re arranging of the scheduele I was able to free myself up for that day & without hesitation I said yes, I mean come on, who would pass up this epic opportunity to hang out with them for a day and show them all that our beautiful city has to offer, especially after missing them the first time round. So I made my way to Cape Town International to pick them up. With them was Steve-O, his manager Scotty Randolph, Tommy Caudill, and photographer Paul Briskke, who are all absolute legends ill have you know! We darted back to the Hotel in Town where they dropped off their luggage and then we hit the coastal road. Now prior to them arriving I was chatting to Scotty asking him what they would like to see and do, giving them a list of different options with epic adventure activities on, which they weren't interested in. No, they wanted to see Baboons. 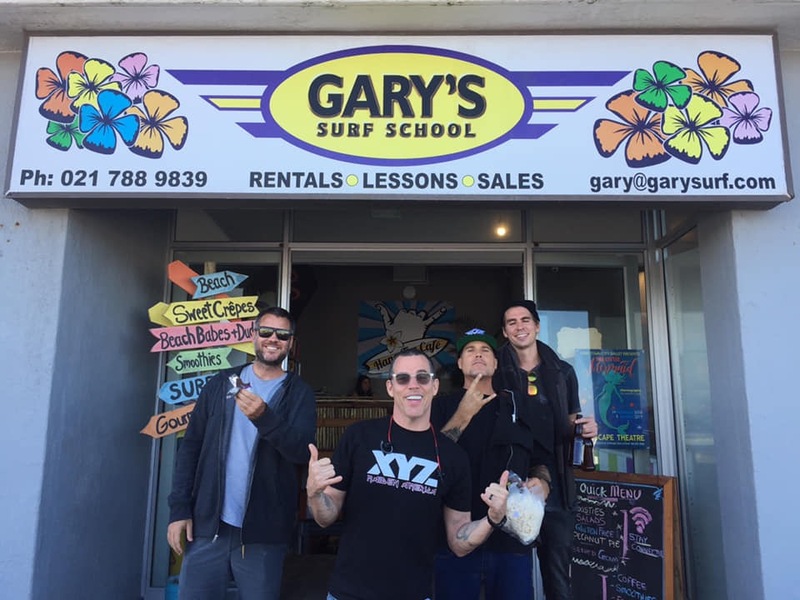 So after driving over Chapmans peak and stopping off in Noordhoek for some lunch, we made our way to Gary's Surf School in Muizenberg where they were going to go surfing. Steve was telling me that every new destination they visit, they like to "get a stamp in their passports" along with photos of each new place they surf. Unfortunately the waves were messy and the wind was up (welcome to Cape Town right), so we decided to jump in the car and carry on our journey to Kommetjie and from there around the mountain towards Cape Point where we would hopefully have sightings of baboons. Now those of you who live here know that you can't just see baboons on demand so I was bit nervous that I couldn't deliver, especially after not getting in the water for a surf. On route to Cape Point we saw the baboon rangers, I stopped the car immediately and we all jumped out. After 10 minutes of looking for them, in the bush, we found them, a whole troop of them! The boys faces lit up and they were stoked, baboons everywhere, from babies to adults, they were doing their thing. I was so relieved! We spend about 30min with them and they were getting some photos and videos to prove their find. I can't really say much more of why they were here and what they main objective of being here was but I thought it was a pretty cool story and wanted to share. I find it amazing how the world works. One thing I can tell you is that they may be back here later this year and if they do come back, our new Mobile surf school - Gary's Mobile Surf School which is run by Matthew, Gary's son, will definitely get the boys into the water and get that stamp in the passport!